AND Add Real Value to My Business?" 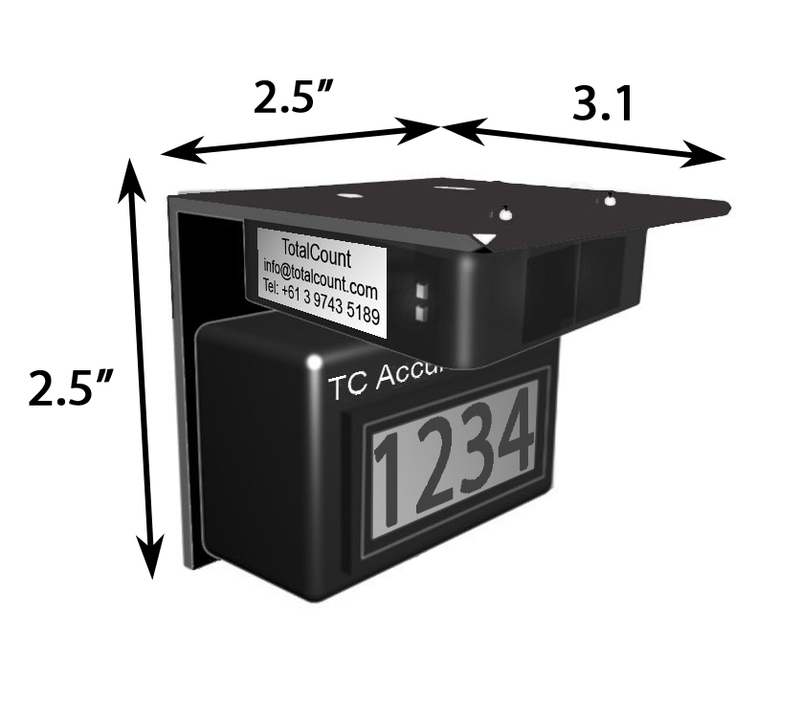 TC Accurate One People Counters delivered using international standard post expected to take 5-12 business days to be delivered. Also available shipping via International Express Post delivery time 3-6 business days. A Simple and Effective way to Count People Traffic. If the Accurate One People Counter doesn’t live up to your expectations, if you are not totally impressed with it – don’t hesitate – send it back to us and we will refund the purchase price. The Accurate One suits counting visitors or customers to retail shops, libraries, visitor information centres, Museums, Art-Galleries and Tourist attractions. The Accurate One comprises a Photo Electric Sensor and Counter Module on a single Black mounting Bracket with a Power Adapter to plug into a power outlet. The sensor is positioned looking across at its Reflector. The unit can span up to a distance of 17 feet (5 metres). The Accurate One is the result of 10 years of experience in supplying and installing People Counters. 1. The Sensor and Counter Module are on a single mounting bracket. The unit is simple to install with only 2 screws or even double-sided tape. 2. The bracket is slightly larger than the sensor and counter module so that if the unit is bumped accidentally, even in a hard fashion, the sensor and counter are protectedand they won’t get damaged and the sensor won’t be moved out of alignment with the reflector. 3. You have flexibility in mounting the system as the Sensor can be bolted onto the bracket either looking to the front or to either side. 4. The attractive Matt Black color and totally silent operation make it ideal for a shop environment. 5. Reset the Count to Zero using a Magnet applied externally to the right of the LCD – two Magnets are included in the pack. 6. 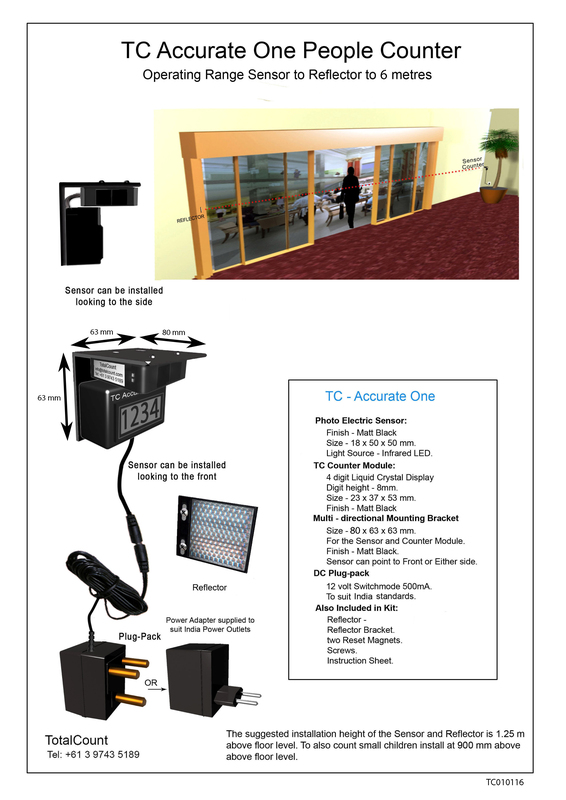 The unit is quite small so it can be discreetly setup at the entrance to your shop. In the pack you get everything you need to setup the unit. There is detailed Instruction Sheet in the Pack. It really is as simple as plugging the Supplied AC DC Power Adapter into a power outlet and pointing the Sensor at its Reflector. It is ready to count. Size – 0.71 x 2.00 x 2.00 inch. For the Sensor and Counter Module. DC Power Adapter – to US Standards. We act quickly on receipt of your order – you can expect delivery in 5 to 10 business days. P.S. You deal directly with us – there is no distributor or middleman pushing the price up 30 to 70 %. The Accurate One People Counter is sent to You Direct from our factory. Copyright © 2019 Total Count. All Rights Reserved.